A bit late I know, but I have been in Gothenburg with the British junior team all week, preparing for JWOC. The JK long distance went really well for me, I felt very strong for almost 90 minutes, and it was my best race technically of the weekend. I chose some good routes, and I missed less than 1 minute on the whole course. 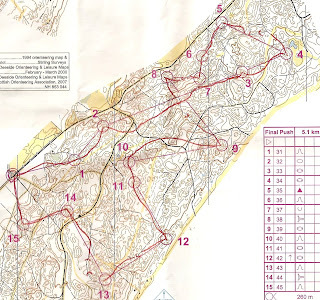 This was partly a reflection of the course, which was not overly difficult, without many shorter technical legs. It is a lovely place to run though, and I was pleased to get past the 14th control before Daniel Hubmann (my 3 minute man) caught me. I hadn't really decided on a strategy for when he came past, but I decided to stay with him for a bit (to 15 and 16), then I ran straight to 17 when he went along the road. I missed the control a bit and got about 15 seconds behind, but then I caught him again on the long leg to 19, and it was easy to run together from there to the finish. I finished 2nd behind Daniel, and also for the weekend overall. Only slight problem was I strained my calf a little bit towards the end of the race. The relay was the conclusion to the weekend. 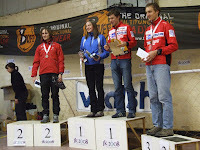 My team OD finished 5th (3rd British team) which is pretty good. Luckily I was able to cruise last leg a bit as we had a bit of a gap, so I could rest my calf a bit. Then it was off to Gothenburg, where there was about 30cm of snow. I did some control hanging etc, trying to protect my calf a bit, and now I am back in Stockholm. I am going to rest my leg for a few days now, so it is better for the GB camp to Czech coming up soon. So far this weekend, there have already been two competitions in the JK. This year, the competition is in the South East of England, and yesterday things kicked off with a sprint race at the University of Surrey. 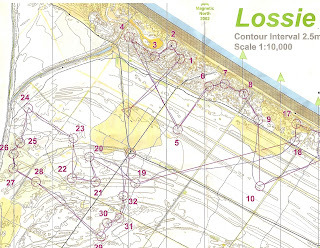 This was the venue for the World Cup Sprint Qualification in 2005, so many of the runners were familiar with the area, but the planner set some really technical courses, with plenty of route choice, and tricky legs almost constantly. 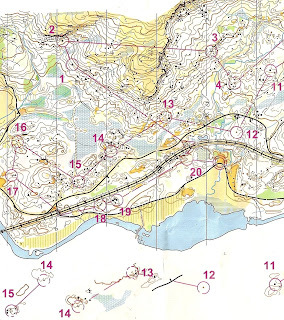 Nobody managed to have a clean race, but Hubmann managed to hold it together best, in front of Scotia and Øysein. I was 5th, 26 seconds behind having had a very scrappy run, no big mistakes, but small errors cropping up all over the place - fantastic start to the weekend though in terms of orienteering. 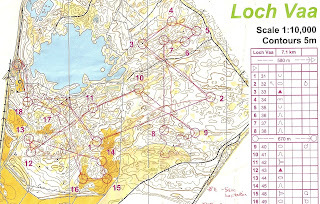 Results here, splits here, photos here, routegadget here. going to be a lot of short technical legs, and lots of changes in technicality and runnability, but I was also planning to go out hard. I ran quite well at the start, a little bit scrappy again, and I lost about 30 seconds on the tricky 5th leg. 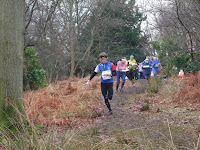 The 8th leg, I managed to run past the control without seeing it, and lost around 40 seconds. Then I proceeded to miss the 10th control. After that I gave myself a mental slap, and tried to focus well for the second half of the course. It worked well, and I motored round the rest of the course, with barely a second lost. Having been a minute down on Baptiste at 10, I managed to just pip him for 3rd on the run in, just 15 secs behind Hubmann and 30 secs behind Scotia, who is on fire so far this year. 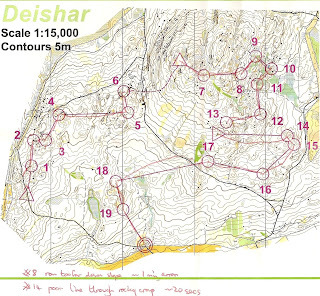 So in summary, I feel fitter than I have ever been before - I won the long leg with the big climb to 14, and I when I am focusing well I am orienteering pretty well, but still too many small errors. Happy with the position - might get some good ranking points! But slightly disappointed with ~1.45 time loss. Results here, splits here. No pictures or routegadget yet. As a 'local' runner, I have been asked to do loads of publicity stuff for the event, you can see an article on the BBC website which is quite cool, and I was interviewed on local radio yesterday morning - I had about 30 seconds warning... You can listen here. Last week I was in Speyside in Scotland with the British team. The last few years we have tended to travel abroad for technical training camps, but this year we looked north and I have to say, it was one of the best training camps I have ever been on. There was a really good group of guys, we were training on some of the best maps and in some of the best terrains in the world. The weather was mixed, but it was never really cold, and we only had snow on one morning (although not where we were training). I had a slight problem with my knee for 2 days, so I got some hours in on the bike as well. Below are a few of the maps we trained on, and some pictures from the week. Got to be one of the most inspiring places for training.